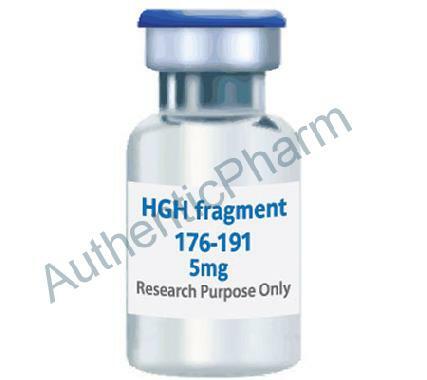 HGH fragment 176-191 is a stabilized analogue of the growth hormone-releasing factor (GRF) that induces Growth Hormone (GH) in a specific and physiological manner. To date, studies suggest that HGH fragment 176-191 has several beneficial features: it reduces abdominal fat, without compromising glycemic control (blood glucose), it increases muscle mass and improves the lipid profile. HGH is Human Growth Hormone, a natural hormone produced in the pituitary gland of the brain. HGH is considered "the key" hormone because it controls so many functions. It's responsible for youth, vitality, energy and all of the health benefits we associate with youth. Dr. Daniel Rudman's study in the New England Journal Of Medicine demonstrated the remarkable ability to reverse the effects of aging upon the human body with the employment of HGH - Human Growth Hormone! Due in part to his efforts, Dr. Rudmans's study saw the effects of HGH upon overweight men between the ages of 61 and 80 years of age. HGH reduces body fat. The men did not alter their personal habits of eating, smoking, or exercise, yet with the consumption of HGH, they lost an average of 14% of their body fat, while gaining an average of 8.8% lean muscle mass. Their skin became firmer and they experienced a localized increase in bone density. Over all, HGH appeared to reverse the effects of aging by 10-20 years. HGH promotes growth in children and plays an important role in adult metabolism. The body secretes the hormone, in decreasing amounts, throughout our lifetimes. The amount of hormone in the body can be measured by levels of IGF-1 (Insulin Growth Factor). Growth hormone has a profound effect on all the cells of the body, more than any other hormone because it is the cell generator.